What comes to mind when conceptualizing a new garden design? Color? Absolutely. Soil and sun conditions? That’s a given. Texture? Sure thing. Two other components of plant selection that are of utmost importance are adding biodiversity and sustainability. Both of these elements are omnipresent in gravel gardens. 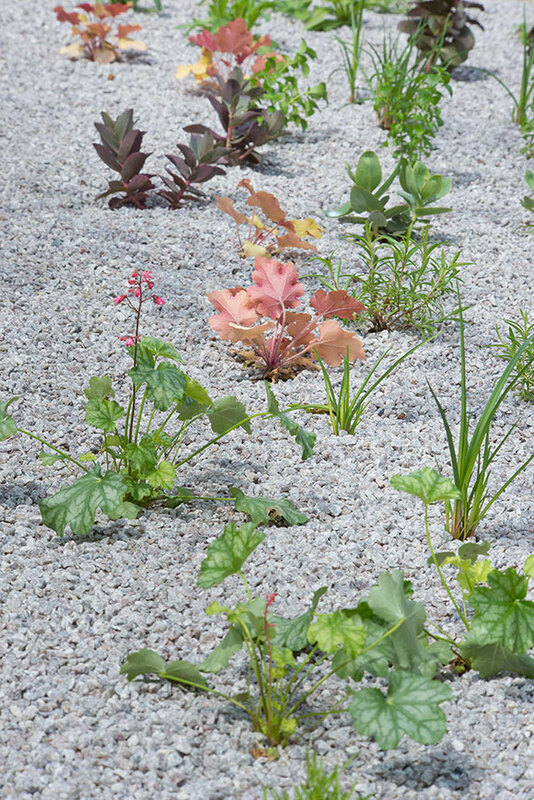 The origins of gravel gardening are rooted in Essex, EngIand, via Beth Chatto, Cassian Schmidt at the Hermannshof Garden in Germany, and Roy Diblik of Northwind Farm in Wisconsin. I was introduced to gravel gardens while I lived in Madison, Wisconsin. Not only were gravel gardens featured at Olbrich Botanical Garden, but they were also on display at my previous place of employment, Epic Systems, in Verona, Wisconsin. Jeff Epping, the director of horticulture at Olbrich, established the gravel gardens at both Olbrich and Epic Systems, and has been very supportive in my mission to bring these types of gardens to the Chicago Botanic Garden. The heavy, clay-laden soils of the Chicago area are infamous to anyone who has gardened here. 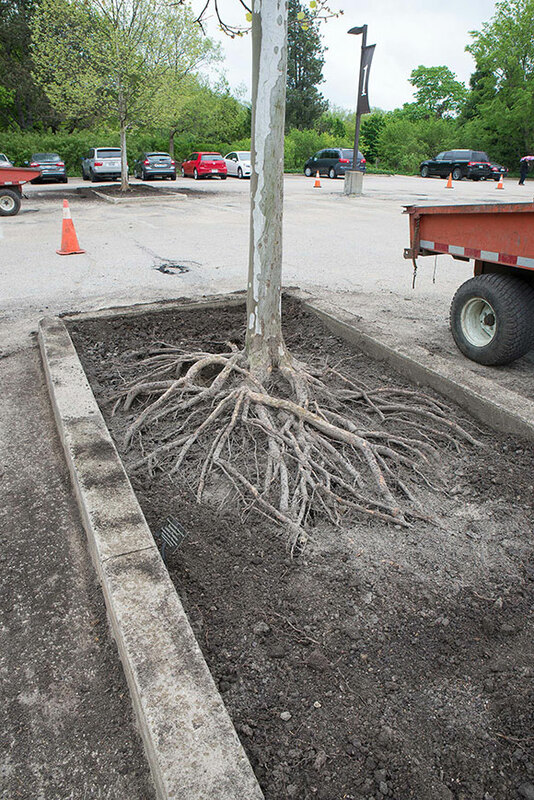 No one escapes the frustration the water-retaining properties of these soils causes. Midwestern gardeners often amend the soil in their home gardens. But amending soils in garden beds each season to improve plant health and drainage can also be an expensive endeavor for the home gardener. The first step in prepping the beds is removing the top layer of soil. This season, as a trial, we are converting ten island beds in parking lot 1 to gravel garden beds. These beds are covered by 4 to 5 inches of pea gravel. The gravel allows plants to grow in sharp drainage, which is a very desirable attribute when growing many native prairie plants or other dry-loving plants. Ours include coneflower (Echinacea paradoxa), ‘Siskiyou Pink’ beeblossom (Gaura lindheimeri ‘Siskiyou Pink’), and ‘Red Rocks’ beardtongue (Penstemon x mexicali ‘Red Rocks’). The key to establishing the plants in a gravel garden is to prevent the root balls from drying out until they have a chance to root down below the gravel layer. This means watering new plantings daily, or even twice daily if weather conditions dictate. Although a significant commitment to watering is required up front, watering can be reduced six to eight weeks after planting, and nearly eliminated after two years. In fact, with the exception of times of extreme drought, no supplemental watering was necessary for the gravel garden beds I managed at Epic Systems. Plantings include succulents and drought-hardy plants. They will need careful monitoring at first, but once established, this bed will be a beautiful, low-maintenance garden. Another benefit of growing plants in 4 to 5 inches of gravel? A significant reduction in the number of weeds! Since no soil exists in the top 4 to 5 inches of the bed, weeds don’t have a chance to root in. Maintaining this “sterile” environment is a matter of simply making sure old plant material is removed from the bed each spring, and that no organic material is left on the beds (which could potentially break down to humus). Not only will these beds help to bring added color to the parking lots as they fill in, but they will also introduce new taxa to the Garden. Although these beds will be full of color in time, we will need patience in the short-term. The beds will take some time to establish, with only a few flowers this year, a bigger display next year, and with the beds hitting maturity in 2019. It is my hope that this patience will give way to something beautiful for years to come.